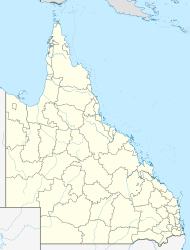 Innisfail (from Irish: Inis Fáil) is a town and locality in the Cassowary Coast Region in Far North Queensland, Australia. The town was originally called Geraldton until 1910. It is the major township of the Cassowary Coast Region and is well renowned for its sugar and banana industries, as well as for being one of Australia's wettest towns. In March 2006, Innisfail gained worldwide attention when severe Tropical Cyclone Larry passed over causing extensive damage. In the 2016 census, the town of Innisfail had a population of 7,236 people. Prior to European settlement the Innisfail area was occupied by five separate societies of the Mamu people. These Aboriginal people followed migratory lifestyles in the rainforest and traversed rivers in string-bark canoes. A most glorious view appeared - a noble reach of fresh water, studded with blacks with their canoes and catamarans, others on the sandy beaches; deep blue fresh water expanding to an imposing breadth. In October 1873, Johnstone again returned as part of the Northeast Coast Expedition led by the explorer George Elphinstone Dalrymple. British settlement was first established at the junction of the north and south branches of the Johnstone River by this expedition on the 5th October 1873. It was named Nind's Camp after Philip Henry Nind who accompanied the party. Later in 1879, Irishman Thomas Henry Fitzgerald arrived in the area to establish a sugar industry. He was accompanied by large numbers of Kanaka South Sea Islanders workers accompanied by smaller numbers of Irish labourers. The house built by Fitzgerald and thus the first establishment in the area was called Innisfallen, after the largest island in the Lakes of Killarney, Ireland. Inis Fáil (Island of Destiny) is an ancient Irish name for Ireland itself. The name is used in the rarely-sung third verse of "The Soldier's Song", the Irish national anthem. The stone mentioned may be the stone at Tara, Co Meath, at which high kings of Ireland were crowned. From 1879, the settlement was named Geraldton (officially in July 1883) by Fitzgerald, but on 20 August 1910 it was renamed "Innisfail" to avoid confusion with the town of the same name in Western Australia. Johnstone River Post Office opened on 1 November 1882 (a receiving office had been open from 1880), was renamed Geraldton two months later and Innisfail in 1910. In May 1885, the Queensland Government called for tenders to build the Geraldton Hospital to replace the existing tent hospital; however, the tenders submitted were more expensive than the government was willing to pay, so they called again for tenders in September 1885 resulting in a contract with E. Couchman for £1527. In 1906, Patrick Leahy established the Johnstone River Advocate newspaper, with the first issue published in December that year. Later it was renamed the Johnstone River Advocate and Innisfail News, the Evening Advocate, and the Innisfail Chronicle. The newspaper continues to be published as the Innisfail Advocate. The 1920s and 1930s saw the beginning of a major period of settlement by Italian immigrants and noteworthy populations from Greece and Malta. Later in this period populations from Yugoslavia, India and the Philippines would also settle in the area. Local rugby league footballer Kerry Boustead was the only player from outside the Sydney and Brisbane Leagues selected to represent Australia on the 1978 Kangaroo tour. The Innisfail War Memorial in Jack Fossey Park on Fitzgerald Esplanade was dedicated on 16 April 2005; it commemorates those who served in all wars. In the 2006 census, Innisfail had a population of 8,262 people. Today the town still boasts many good examples of the Art Deco and Streamline Moderne styles of architecture. Innisfail is diverse. There are populations of indigenous Australians, Europeans (in particular Italians), South Asians and East Asians (in particular Hmongs). In 2001 Los Angeles band Sugar Ray filmed part of their music DVD "Music in High Places" at the Johnstone Crocodile Farm in Innisfail. The township has only 2 secondary schools: Good Counsel College and Innisfail State College and a single business district. While Innisfail was always reputed to have a positive sense of community spirit, the aftermath of Tropical Cyclone Larry and the unified cleanup effort acted to promote this spirit through shared suffering. The Cassowary Coast Regional Council operates a public library at 49 Rankin Street. The current library opened in 2015. The Innisfail branch of the Queensland Country Women's Association meets at the CWA Hall at 1 McGowan Drive. Chinese Australians built the Innisfail Temple/Lit Sing Gung (列聖宮) in Owen Street, which is now open to other races and religions. Innisfail's town centre is situated at the junction of the North and South Johnstone Rivers, approximately 5 km (3 mi) from the coast. It is located near large tracts of old-growth tropical rainforest surrounded by vast areas of extensive farmlands. Queensland's highest mountain, Mount Bartle Frere; part of Australia's Great Dividing Range, is 15 kilometres (9 mi) to the north. Although the rest of Queensland is dominated by savannas, Innisfail experiences a tropical rainforest climate (Köppen: Af) as it has no month with a mean temperature below 18 °C (64.4 °F) or with less than 60 millimetres (2.4 in) of rainfall. However as a trade-wind climate which besides knows frequent cyclones it is not equatorial. Consistently, humid, very warm to hot weather dominates in Innisfail. In particular Innisfail is reputed as being among the wettest towns in Australia. Babinda, 30 kilometres (19 mi) north of Innisfail is generally considered to be the wettest. Unlike most of tropical Australia, the southern winter or "dry" season is not completely dry as moist easterly winds bring frequent showers; rainfall is, however, still far lower than during the southern summer. Monthly totals of over 1,000 mm (39 in) are a routine occurrence in the region between January and April and some months will not experience a day without rain if the monsoon is unusually heavy. The town gets around 71.8 clear days per year. Innisfail is consistently under threat from tropical cyclones developing in the Coral Sea in and around summer months. Furthermore, high rainfall associated with aforementioned cyclones and monsoons, combined with Innisfail settlement on adjoining rivers causes flooding to be commonplace, occurring to varied degrees of severity annually. Innisfail suffered extensive damage in 2006 due to Cyclone Larry as the site of landfall and received over 100mm of rain in the span of three hours. Tropical Cyclone Larry, an Australian Category 5 cyclone, struck the locality at 7am on 20 March 2006, with the eye of the storm passing over the town. Severe structural damage occurred over the entirety of the township, the main damage being a portion of houses losing roofs and windows and the cyclone rendered even more homes structurally unsound. Power was effectively eliminated from the town and generators became a luxury in many homes. Clean drinking water was also compromised in many homes leading to health fears. The swift response of the Australian Defence Force was praised by many and the cleanup campaign they orchestrated allowed for total utilities restoration within 3 weeks. Severe damage was done to crops and plantations (mainly bananas) which had a serious economic impact on the region. Only one indirect death was record as a result of the cyclone. Cyclone Larry was a direct and primary cause of the widely reported and dramatic surge in banana prices in Australia. Inflated cost remained until farmers were able to meet demand again in early 2007. In February 2011 Cyclone Yasi hit Innisfail. In 2011, in the early morning of 3 February, Cyclone Yasi crossed the far north Queensland coast causing damage to the Innisfail area. Although the damage was not as severe as Cyclone Larry, Cyclone Yasi still had a huge impact on Innisfail bringing strong winds of possibly 285 kilometres per hour. On 8 February 2007 the Johnstone Shire Council was sacked by the Queensland State Government by Queensland's Local Government Minister, Andrew Fraser because of internal conflict, inappropriate behaviour and financial problems, despite an issued show cause presented on 2 August 2006. The purchase of a $250 000 Steinway Model D Piano with insurance money from Cyclone Larry. While 2 councillors had attempted to get the Queensland Government to revoke the decision Andrew Fraser has stated that while the action is regrettable it was indeed the correct decision. Johnstone River, Innisfail with prawn boats in foreground. The main industries remain predominately banana and sugar cane and have since recovered from the natural disaster. Outlying areas of Innisfail have also resumed manufacture of tea, pawpaws and other exotic fruits. Innisfail remains a popular destination for backpackers seeking employment in the fruit picking industry. Tourism is of importance to the township and the town consistently seeks to attract visitors passing through on the Bruce Highway. Scott Bolton, rugby league player for the North Queensland Cowboys, grew up in Innisfail. Jessica-Rose Clark, mixed martial artist currently signed to the UFC. Steve Corica: retired footballer who was capped numerous times for Australia and played in England, notably for Wolverhampton Wanderers, was also capped over 100 times for Marconi Stallions in the ex-NSL and Sydney FC in the A-League. Brent Cockbain former international rugby player (2003 World cup for Wales) grew up in Innisfail. Joseph Costa, BMX rider, grew up in Innisfail. Costa is a consistent BMX competitor. Ty Williams, former professional rugby league footballer for the North Queensland Cowboys and Queensland grew up in Innisfail. Williams returned to Innisfail to captain/coach the Innisfail Leprechauns in 2014. Elizabeth Haran's 2003 novel Sunset over Eden is set in the town. ^ a b Australian Bureau of Statistics (27 June 2017). "Innisfail (UCL)". 2016 Census QuickStats. Retrieved 19 April 2019. ^ a b c "Walkabout - Innisfail". Archived from the original on 30 June 2006. Retrieved 2 June 2006. ^ a b J. W. Collinson. "Innisfail - History" (PDF). Text Queensland. Journal of the Royal Historical Society of Queensland. pp. 10, 16. Retrieved 19 April 2019. ^ a b c "Innisfail - climate statistics". Climate Data Online. Bureau of Meteorology. Archived from the original on 19 April 2019. Retrieved 19 April 2019. ^ a b "Innisfail - town (entry 40993)". Queensland Place Names. Queensland Government. Retrieved 27 March 2016. ^ "Innisfail - location (entry 45710)". Queensland Place Names. Queensland Government. Retrieved 27 March 2016. ^ "Tourism and Regional Information". Archived from the original on 23 May 2006. Retrieved 2 June 2006. ^ "Australian Bureau of Meteorology Severe Tropical Cyclone Larry Report". Archived from the original on 22 September 2012. Retrieved 2 June 2006. ^ "SKETCHER". The Queenslander (1984). Queensland, Australia. 19 March 1904. p. 2 (Unknown). Retrieved 3 September 2018 – via National Library of Australia. ^ "SKETCHER". The Queenslander (2015). Queensland, Australia. 22 October 1904. p. 8. Retrieved 4 September 2018 – via National Library of Australia. ^ "CHANGE OF NAME". Cairns Post (Qld. : 1909-1954). Qld. : National Library of Australia. 19 August 1910. p. 5. Retrieved 9 March 2011. ^ "OFFICIAL NOTIFICATIONS". The Brisbane Courier. XXXIX, (8, 527). Queensland, Australia. 9 May 1885. p. 3. Retrieved 21 October 2017 – via National Library of Australia. ^ "JOHNSTONE RIVER". The Brisbane Courier. XL, (8, 635). Queensland, Australia. 14 September 1885. p. 3. Retrieved 21 October 2017 – via National Library of Australia. ^ "Official Notifications". The Queenslander. XXVIII, (522). Queensland, Australia. 26 September 1885. p. 504. Retrieved 22 October 2017 – via National Library of Australia. ^ "NEWSPAPER LOSSES". Cairns Post (10, 513). Queensland, Australia. 18 October 1935. p. 16. Retrieved 24 April 2019 – via National Library of Australia. ^ "Historical Notes on North Queensland Newspapers". www.jcu.edu.au. Archived from the original on 9 November 2017. Retrieved 2 December 2015. ^ "History of the Innisfail Region". Archived from the original on 14 May 2006. Retrieved 2 June 2006. ^ "Innisfail Cenotaph". Monument Australia. Archived from the original on 7 April 2014. Retrieved 5 April 2014. ^ Australian Bureau of Statistics (25 October 2007). "Innisfail (Urban Centre/Locality)". 2006 Census QuickStats. ^ "Innisfail Court House (entry 601578)". Queensland Heritage Register. Queensland Heritage Council. Retrieved 7 July 2013. ^ "See Poy House (entry 602759)". Queensland Heritage Register. Queensland Heritage Council. Retrieved 7 July 2013. ^ "Canecutters Memorial (entry 602041)". Queensland Heritage Register. Queensland Heritage Council. Retrieved 7 July 2013. ^ "Johnstone Shire Hall (entry 601579)". Queensland Heritage Register. Queensland Heritage Council. Retrieved 7 July 2013. ^ "St Andrew's Presbyterian Memorial Church (entry 602332)". Queensland Heritage Register. Queensland Heritage Council. Retrieved 7 July 2013. ^ "SRA Fact Sheet Innisfail - Australian Government". Archived from the original on 27 April 2006. Retrieved 2 June 2006. ^ "Innisfail Pioneers - Italian History" (PDF). Archived (PDF) from the original on 24 August 2006. Retrieved 2 June 2006. ^ "Cultural Diversity in the Johnstone Shire Council". Archived from the original on 29 September 2007. Retrieved 2 June 2006. ^ "About Johnstone Shire Council". Archived from the original on 15 June 2005. Retrieved 2 June 2006. ^ "Community Spirit - Winter 2007". Archived from the original on 28 September 2007. Retrieved 2 June 2006. ^ "Innisfail Library". Public Libraries Connect. 10 January 2018. Archived from the original on 19 January 2018. Retrieved 19 January 2018. ^ "Queensland Public Libraries Statistical Bulletin 2016-17" (PDF). Public Libraries Connect. November 2017. Archived (PDF) from the original on 30 January 2018. Retrieved 19 January 2018. ^ "Innisfail - Google Maps". Retrieved 2 June 2006. ^ "Mt. Bartle Frere Trail". Archived from the original on 18 June 2006. Retrieved 2 June 2006. ^ Linacre, Edward; Geerts, Bart (1997). Climates and Weather Explained. London: Routledge. p. 379. ISBN 0-415-12519-7. Archived from the original on 24 June 2016. Retrieved 22 September 2016. ^ "Interactive Australia / New Zealand Koppen-Geiger Climate Classification Map". www.plantmaps.com. Archived from the original on 6 March 2019. Retrieved 6 March 2019. ^ "Tully - Cairns Connect". Archived from the original on 2 May 2006. Retrieved 2 June 2006. ^ "Median Rainfall for July". Archived from the original on 24 September 2015. Retrieved 2 June 2010. ^ "Summary statistics SOUTH JOHNSTONE EXP STN (mean daily sunshine hours)". Bureau of Meteorology. May 2012. Archived from the original on 3 September 2017. Retrieved 4 July 2012. ^ "List of Queensland Cyclones - Windworker Roof Renovations". Archived from the original on 29 April 2006. Retrieved 2 June 2006. ^ "Flood Warning system for the Johnstone River". Archived from the original on 16 June 2006. Retrieved 2 June 2006. ^ "ABC news - Innisfail Devastated". Archived from the original on 21 April 2006. Retrieved 2 June 2006. ^ "Australian Banana Growers Council - Cyclone Larry Report". Archived from the original on 15 October 2006. Retrieved 2 June 2006. ^ "Sydney Morning Herald - Disaster drives big price surge". The Sydney Morning Herald. 21 March 2006. Archived from the original on 18 June 2006. Retrieved 2 June 2006. ^ "Severe Tropical Cyclone Yasi". Bureau of Meteorology. Bureau of Meteorology. Archived from the original on 20 January 2017. Retrieved 2 February 2017. ^ "ABC - Sacking of JSC". Archived from the original on 20 April 2008. Retrieved 2 June 2006. ^ "Queensland Government - Show Cause Issued". Archived from the original on 21 August 2006. Retrieved 2 June 2006. ^ "ABC news story - 'Ineffective Council Sacked'". Archived from the original on 20 April 2008. Retrieved 2 June 2006. ^ "Innisfail Business booming after cyclone - ABC report". Retrieved 2 June 2006. ^ "APIA set up in Innisfail". Archived from the original on 19 August 2006. Retrieved 2 June 2006. ^ "Australian Tropical Fruits". Archived from the original on 4 May 2006. Retrieved 2 June 2006. ^ "Innisfail tourism". Archived from the original on 31 December 2012. Retrieved 2 June 2006. ^ "Joseph Costa". Rival Racing. Archived from the original on 21 December 2014. Retrieved 16 September 2014. ^ "Geringer, Karl". International Federation of Associated Wrestling Styles. Archived from the original on 14 July 2014. Retrieved 22 June 2014. ^ "Shannon McCann". Glasgow 2014 Ltd. Archived from the original on 18 July 2018. Retrieved 11 June 2017. Wikimedia Commons has media related to Innisfail, Queensland. This page was last edited on 24 April 2019, at 05:14 (UTC).